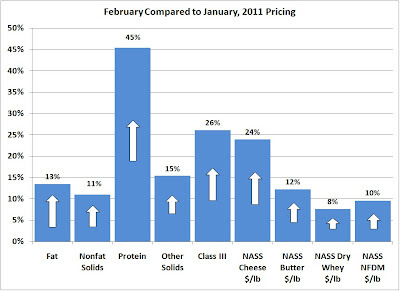 February Class III milk and component prices were announced March 4. 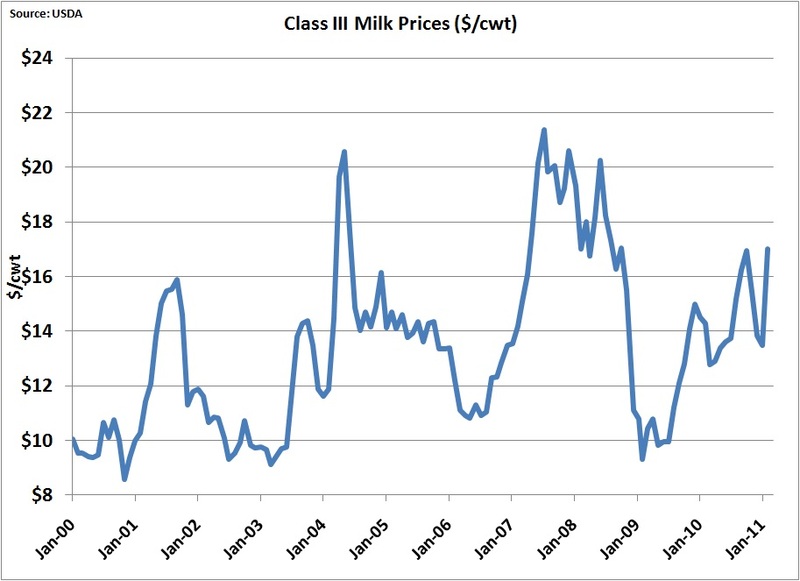 Class III milk futures have been increasing on the CME throughout February and the February announcements were consistent with this activity. 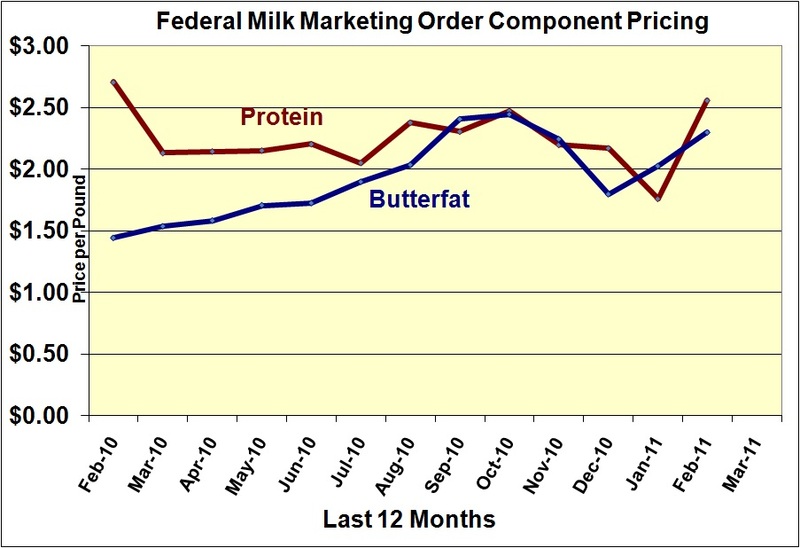 Every single indicator was up, with milk protein increasing 45% from January pricing. 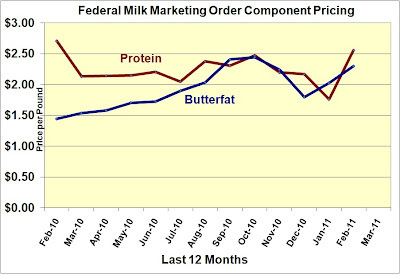 Butterfat and protein prices returned to their more traditional relationship with protein valued higher than butterfat. 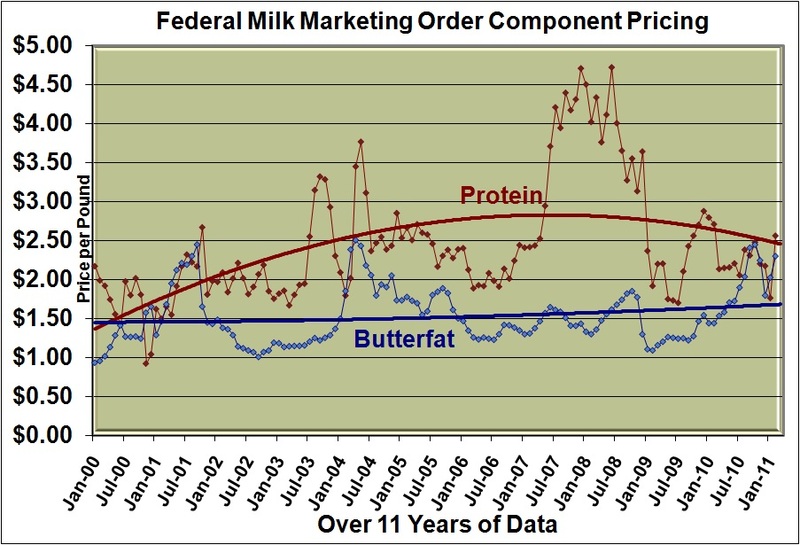 To emphasize this, protein and butterfat are shown below in a simplified graph. 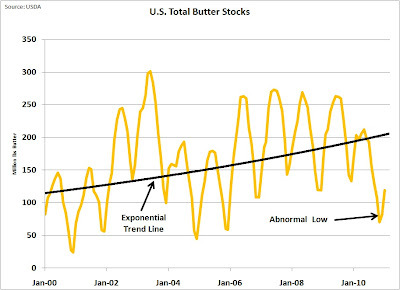 It is unusual for butterfat to be valued higher than protein, but through the last part of 2010 and in January, 2011, the shortage of butter drove up the price of butter and butterfat to unusual highs. The February prices reflect a return to more traditional values. 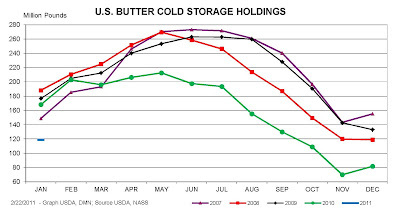 Butter production is starting to show improvement in early 2011. 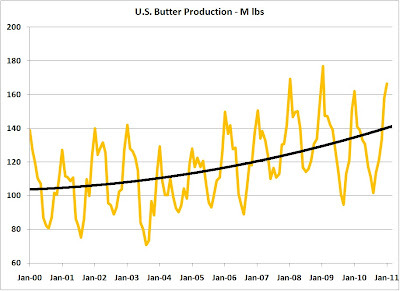 The January production of butter was the highest in two years. 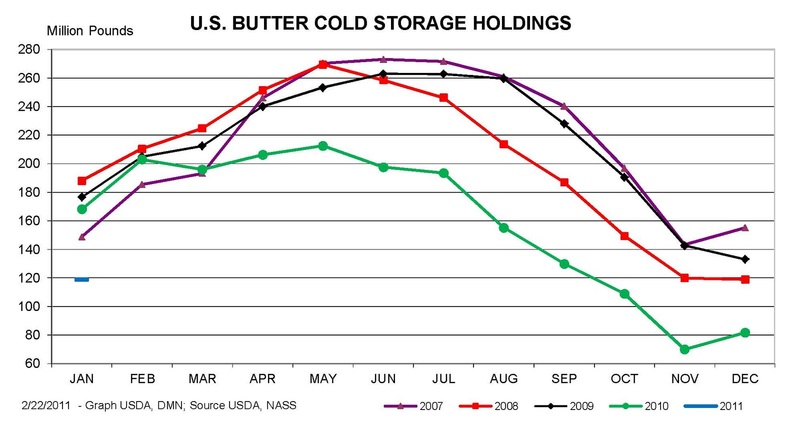 The increased production is impacting butter stocks which have rebounded slightly in 2011. 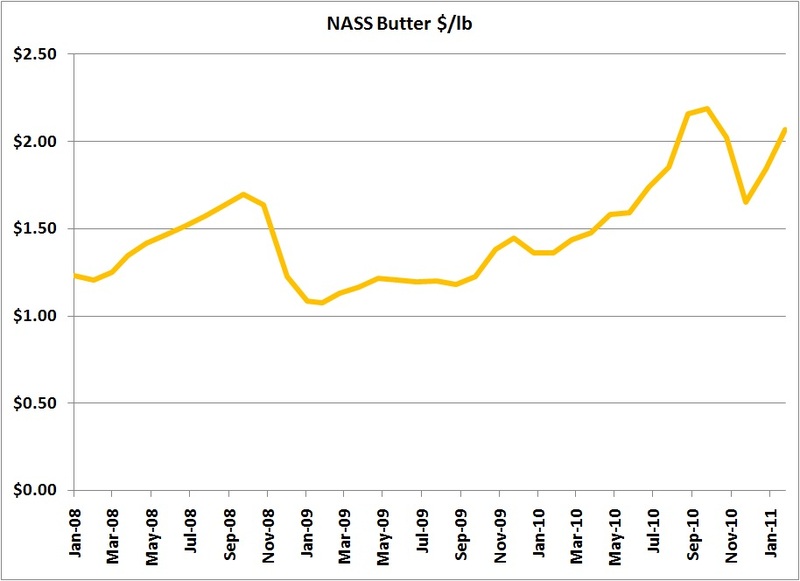 Butter prices did not reflect any decrease in February, but they can be expected to decrease with an improvement in butter stocks. 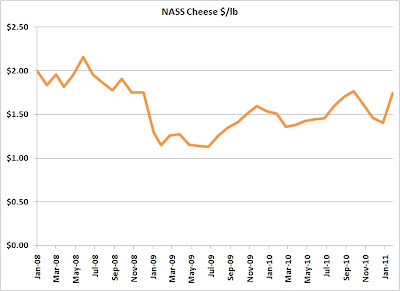 Cheese prices and inventories remain in what appears to be an imbalance. 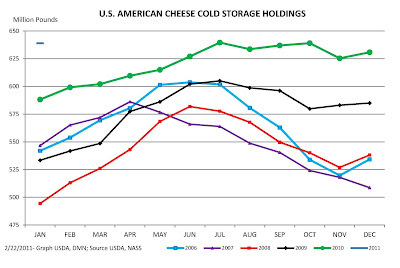 Cheese inventories remain high. This is reflected in both the charts below. While the inventories are no longer growing, they are also not decreasing. 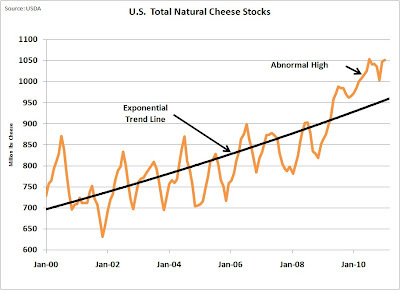 This is reflected in the total natural cheese stocks as well as the American cheese cold storage holdings. There is a lot of expert speculation as to why these inventories are higher. Experts have put forth varying opinions. 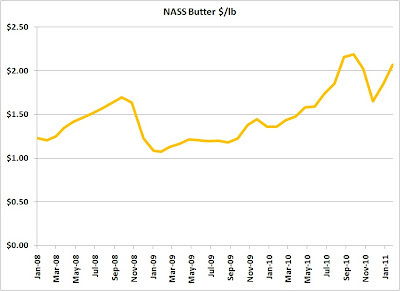 and another analyst believed that the higher inventories result from the NASS survey technique which add and deletes suppliers. His explanation is that the survey has added more new locations than they have deleted. There are some obvious holes in all these explanations. 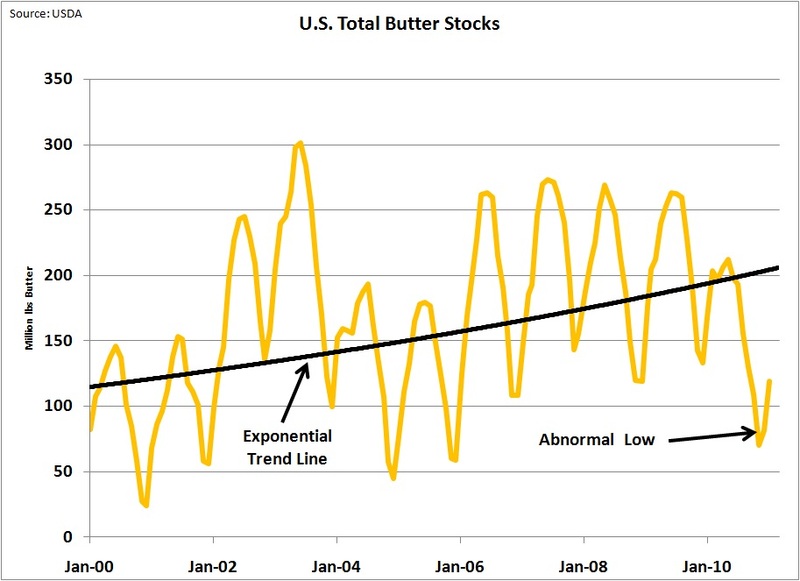 If numbers change, analysts seem to have a need to explain why they have changed. 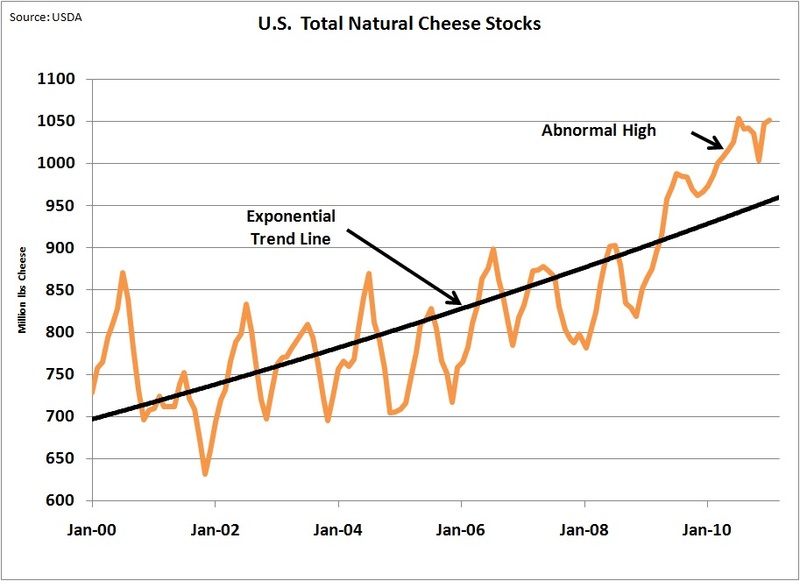 As long as the inventories remain high, the price of cheese could decline. 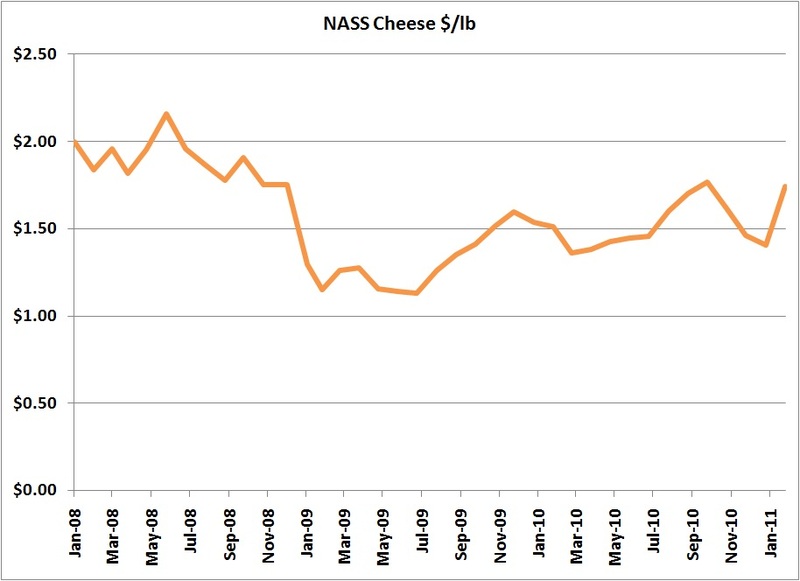 As we know from previous posts to this blog, there is a very tight correlation between cheese prices and Class III milk prices. 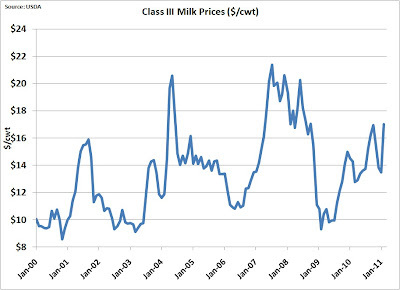 While there is uncertainty in milk prices, the fact remains that Class III milk prices for February are a welcome improvement and the March and April Class III futures are even more robust, currently above $19/cwt. 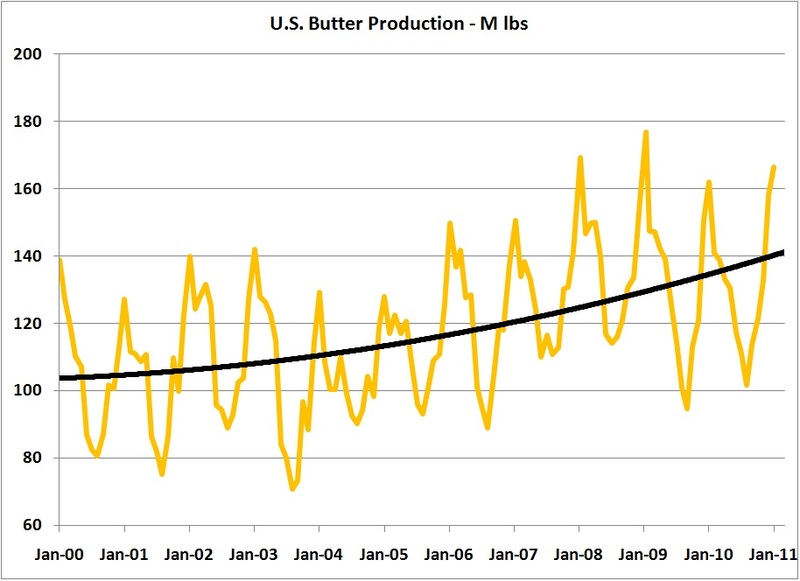 Exports are very strong and as the world recovers from the recession, there is strong hope for a significantly improving outlook for dairy prices. 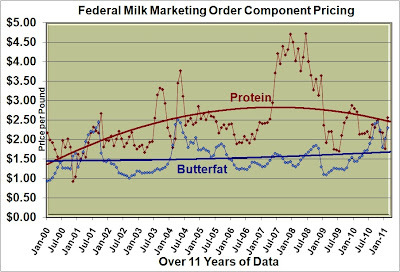 With that statement, if the U.S. is to be a world class dairy competitor, then it must run the lowest cost operations with the highest quality while serving the needs of the International market. There are always new challenges, but there is also no doubt that the U.S. 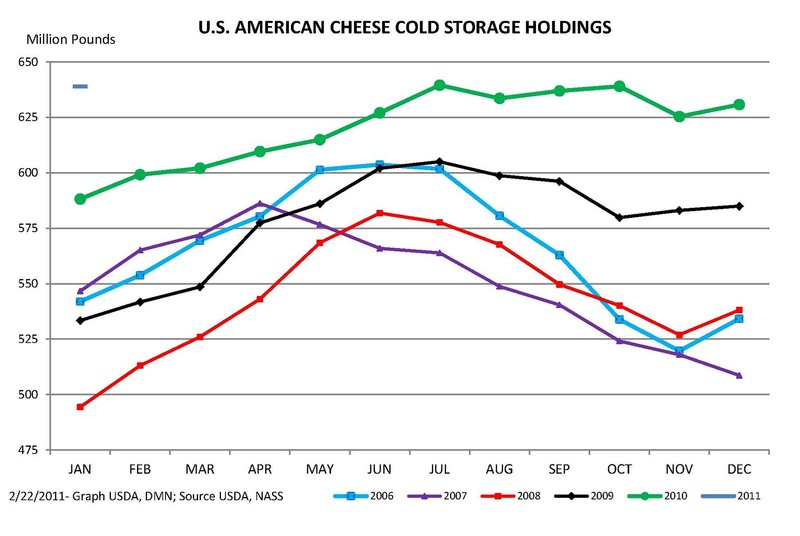 Dairy systems is adapting to these needs.